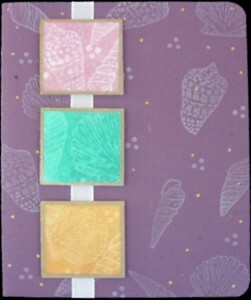 For the three squares: Stamp shells with any of the white colors from the Essential Shades inks. Heat set. Over-stamp with blue, green and yellow Enhancement inks. Rub off excess ink with a paper towel until shells start to appear. Emboss with clear powder and edge with gold pen. Set aside. On burgundy card, stamp Shells and Three Dots stamp randomly using white dye ink. Add single dots with gold pen. Add satin ribbon to left side. Attach shell Squares over ribbon with foam mini dots.